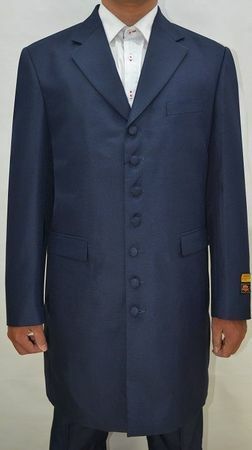 Mens Zoot Suits 3 Piece Navy Long Jacket by Alberto Zoot-100 is the epitome of what a zoot suit is. Once you have this on you will feel like you are back in the 1920's and will be ready to have everyone see how good you look. The jacket is long with 7 buttons a matching vest and pleated baggy pants to complete the ensemble. Made of Poly/Rayon.